In or near the constellation of Orion on a habitable planet on which the observer might have a commanding view of the famous nebula, the early morning sky might look similar to this. The rise of a nearby bright star may be one of several that make for a strange progression of each day. Considerable effort was made to render this careful detail of the actual Orion nebula as it appeared in a reference photograph. The stars in the surrounding space are also carefully placed from accurate photo reference. 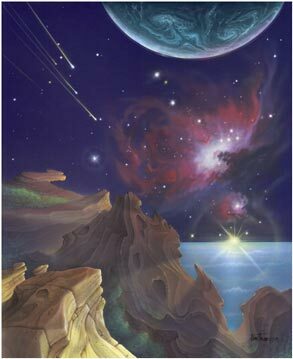 Of course, the planet at the top center is in company with the foreground scene and is only fiction. Here is a case where the morning sky might be a profoundly beautiful sight to behold. The bright splash of local sun or starlight on the sandstone-like cliff face, gives power to the angle of light coming from the horizon and illuminating the stones at the feet of the observer. The gentle kiss of a light and dreamy breeze might be an invigorating touch from this high and inspiring view of this otherworldly ocean below, stretching out to a fantastic horizon. The streaks of a cluster of incoming meteors add the last surprise to this profound experience.